ok i am in love ... this baby rocks ... i'm two stems in and feeling good! definitely a little technique involved (using my sticky brick junior probably gave me a headstart on technique) but i haven't come close to combusting yet and the avb has been even (with stirring between every couple hits). did i mention i love this thing? i am enjoying it my friend! it was a pleasure and i look forward to more transactions in the future! i love the tie-dye background ... big fan ... i have a tie-dye kilt and our mini camper has tie-dyed curtains and sheets! Definitely putting tie-dye sheets on the wish list. I read in 420edc that tha longer 19/22 stems wont work for tha newer versions milaana 2 is that right ???? Do u have any info on this ??? nice kooling stem where did u get it from ??? This is definitely the next vape on my list. I think I wanna wait for Mi3 but these fresh Mi2 are very tempting :sweat: any suggestions on what I should do ? No telling when the 3's will come out and you would be missing a Milaana experience until then. The 420 EDC stems are compatible. Check out Vgoodiez.com for all your RBT stems and needs. my suggestion is get a v2 now and a v3 when they come out ... that is my plan ... especially after using my new milaana 2! 22mm will work for Milaana 2. It's just splinter that takes 19mm. Splinter Z also accepts 22mm. Milaana 3 is a ways out. Not sure I'd wait. I do have 6 more Milaana 2 that arrived yesterday! I'll be reaching out to people! don't wait for a 3 ... go ahead and get a v2 now (especially since @Other Side has a few in stock) they will go fast! you can thank me later! how can I contact u to get one of those if there not all gone ? Please email vgoodiezatgmaildotcom . let me know you came from VL. There are some folks in front of you but I may be able to hook you up. And they gone! More next week hopefully! and I’m now part of the rbt gang I’m super hyped!!! 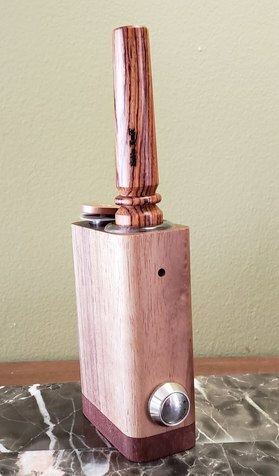 I have a firewood5 my first convection vape and am ready to try this beast. I think I will have no problems adjusting to unregulated power but any of u guys have and tips or suggestions, must have accessories, etc. oh and if anyone is wondering I got the full custom walnut :naughty: . Thanks so much for your support! In my opinion the must have accessories are the cooling mouthpiece stems. Check out the King Kooling Kit where you get both sizes and screens discounted at a bundle price. The Drydrotube is also rocking!! will definitely look into those. Does that new drydro tube work for the Milaana? yep it will. I was using it just last night! ahh it looks kind of tall. Is it a lot bigger than the king kool kit. Yes it is but you basically get no heat. Pure tasty vapor and it's cool. Good for home but not on the go. gotcha I’m whip my M2 stock when she gets here. when I feel like I get the hang of it I’ll invest in both pieces. I really think ima gonna love this vape think it will b my new #1. The stems from Ed's are nice. And if you can find the long green stem with the 19/22 base that stem is awesome for cooling and cheap. how does the wood stem taste ? Do u get a woody accent to the herb ? that's what i'm doing ... getting used to my milaana 2 stock first (and loving it)! @Other Side that King Kooling Kit looks good but how do you self regulate if you don't feel the heat? and did you get my email? The stem is brand new and has a smokey wood smell which to me smells very nice. I got hardly any hint of that when vaping and now after three sessions the outside smells like wood and the inside smells like the flower I was using. yeah you may not feel the heat but you DO feel the lung busting vapor plooms you are drawing in! I go by taste to regulate my mi2 when I use my cooling stem and through my glass rigs. I use the same technique that I would normally use with the short stem. Firewood 4, Milaana, Mist Vape touch and Tubo evic which is the best, differences and comparison ?? Help me decide between Milaana and The Mighty. Do you prefer session or on demand?